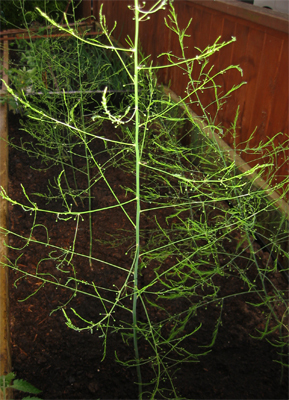 Our gardener says vegetable gardens without growing potatoes are not. In our garden the ROI from growing potatoes can not be beat ! 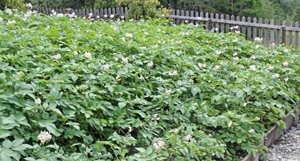 For the past 40 years plus there has always been a spud plant or two or three or more. He says there is not much in this world better than the crisp sweet flavour of new potatoes. ... his emotional bank account is full when the potato nuggets arrive ! In the last week of December he was at the local garden supply store asking when the seed potato would arrive. Not until early March he was told. Pushing it a little ! ... Oh well ! ....... and where in the vegetable garden he will be planting potatoes. Choosing seed potato .... same as other vegetable garden seeds .... planting potatoes you like to eat. Be sure they have the qualities you want...harvest timing and ablility to store well. ... that needs to be in a different backyard garden spot each year. 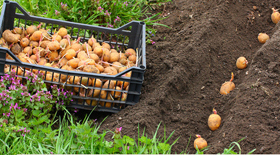 ... a repeat crop of spuds may work well in the same location. 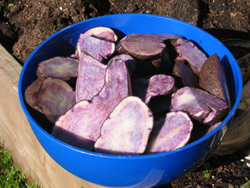 ... planting potatoes both in the backyard garden as well as a raised garden bed (burm) in the front yard. We also heard the gardener say planting potatoes in a grow bag this year might happen. 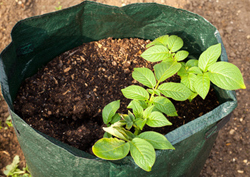 Grow bags or potato growing kits are a great way for small space gardens to experience the joy of growing potatoes. Gro bags are container vegetable gardening gardening. This potting soil will be put to use for a different vegetable growing crop next year. 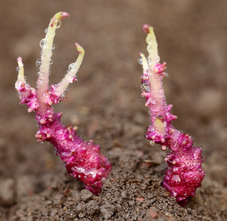 Instead of rotating crops rotate the garden soil. 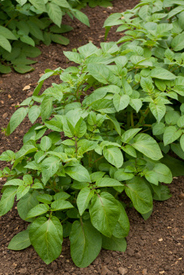 early potatoes can be planted as soon as the garden soil temp is 7 degrees C ( 41 F ) plus. ... our gardener has never needed to do this because of the climate in his growing zone. 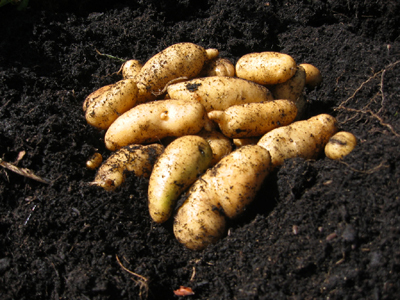 If the ground is frozen late or heavy frost is expected sprouting potatoes may help speed things up. Seed potato golf ball size or less he leaves whole. Good drainage is required no matter. Seed potatoes are best when purchased from the local gardening supply shop. ... They will be guaranteed disease free and will be seed potato varieties that will grow well in the area. ... 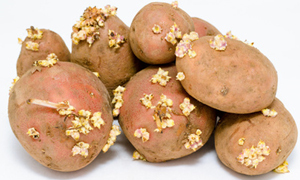 Seed potatoes saved from last year's crop may or may not grow and yield well and may be prone to disease. ... same amount of water for growing spuds in containers but spread it out so soil does not dry out. ... mulch gradually ... this prevents the greening of the potatoes as well as keeping weeds down and moisture in. Green potato is bitter tasting and may make a person unwell. Harvesting potatoes ..... The great reward ! 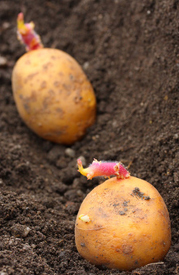 Our gardener plants so he is able to dig and eat the potato crop over the summer. According to him new potatoes are best ..... so he starts digging for nugget potatoes. ... then mid season and main crop. ... This toughens up the skin allowing for better winter storage. .... home grown potatoes or store bought need to be stored in a cool, dark and well ventilated location. .... In farm houses usually the root cellar was under the house for easy winter access. This past season growing potatoes in our yard was a great success. ... Warba, Chieftain and Russian Banana Fingerling potatoes. She was very happy with the results of the potato growing effort. Potatoes are her favorite of the growing vegetables in our garden. Himself thought the yield should have been better. 40 years ... still growing potatoes ... still adjusting his method !! Slow learner ? ........ No it is backyard gardening !